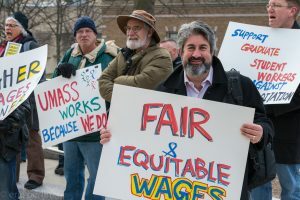 Weinbaum has been organizing since September of 2016 for a new contract on behalf of 1600 professors and librarians at UMass Amherst who belong to the Massachusetts Society of Professors, along with other unions across UMass university systems, including unions for professional staff, graduate employees, and clerical and technical staff. The Advocate attempted to reach Chairman of the Board of Trustees Robert Manning and Vice Chairman R. Norman Peters for comment on the contracts but had not heard back from them by Tuesday afternoon. When asked about the contract situation with union employees, Colin Murphy, director of marketing and public affairs from the the UMass President’s Office, responded with a short statement. “The university deeply values the talent and dedication of our world-class faculty and staff and welcomes their input,” he wrote. 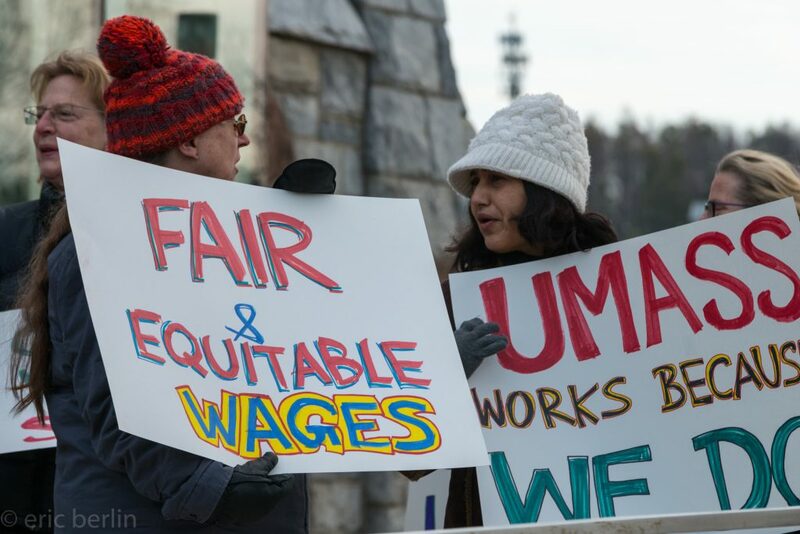 The most recent union contract for UMass employees ended in July of 2017. According to Weinbaum, no union employees have received raises in almost a year. Weinbaum said that the unions have brought three primary goals to the negotiating table: a proposition about pay equity to close the gap in wages, especially around race and gender, increased pay for the lowest-paid employees, and funding for professional development opportunities that would benefit students. “We want to be sure that the trustees hear directly from the people who do the work on campus,” Weinbaum said. Weinbaum was among several speakers who addressed the Board of Trustees on April 6. Weinbaum’s comments made reference to the recent public school teacher protests in West Virginia, Oklahoma, and Kentucky. “Really, what brought the teachers to the streets was looking at the conditions the students were facing,” Weinbaum said. Weinbaum compared K-12 public schools in those states to public higher education in Massachusetts. A study released in March by the Massachusetts Budget and Policy Center shows that Massachusetts has cut higher education funding by 14 percent since 2001, and that higher education spending per student has been cut by 32 percent in the same amount of time. “The whole higher education system is not receiving enough funding. This is not a new trend,” said State Senator Stan Rosenberg, D-Amherst. Rosenberg said public higher education, including community colleges, UMass, and other state universities, has struggled to recover funding from the state after recessions. In the meantime admissions fees more than doubled from 2000-2001 and 2015-2016, which is a rate of increase that is larger than two-third of all other states, according to the Massachusetts Budget and Policy Center report. The Massachusetts Budget and Policy Center report shows that students across the public higher education spectrum pay over half of the total higher education costs, compared to only paying one-third of those costs in the 2001 fiscal year. “Massachusetts may be kind of in an exaggerated position, but this is not a Massachusetts problem, this is a national problem,” Rosenberg said. The local fallout of this nation-wide issue is having an effect on the faculty, staff, and students across the UMass system. Weinbaum said that lack of state funding causes increases in the financial burden on students and on staff and faculty who are often paid less and have less resources. “We think that the workers deserve to have good jobs and the students deserve to have an affordable education,” she said. 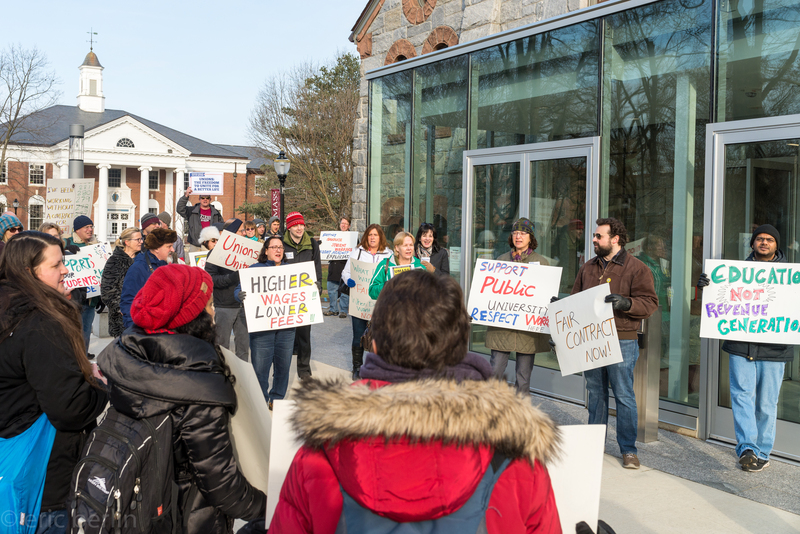 The protest on April 6 was intended to demand fair contracts and to encourage the Board of Trustees to advocate for more state funding from the state Legislature and Governor Charles Baker. The Massachusetts Budget and Policy study reported that higher education spending per student was cut by 32 percent since the 2001 fiscal year. Weinbaum also said that she believes the contracts are taking so long because the Board of Trustees and UMass President Marty Meehan are hoping that the unions will advocate for more funding from the legislature on their own. State Representative Solomon Goldstein-Rose, D-Amherst, said that he has been advocating for more funding for public higher education in the Legislature and that he believes that the Fair Share Act is the best opportunity to increase public higher education funding. The Fair Share Amendment (or the Millionaire’s Tax), would increase taxes on any Massachusetts income above $1 million and put the addition tax revenue towards education and transportation. 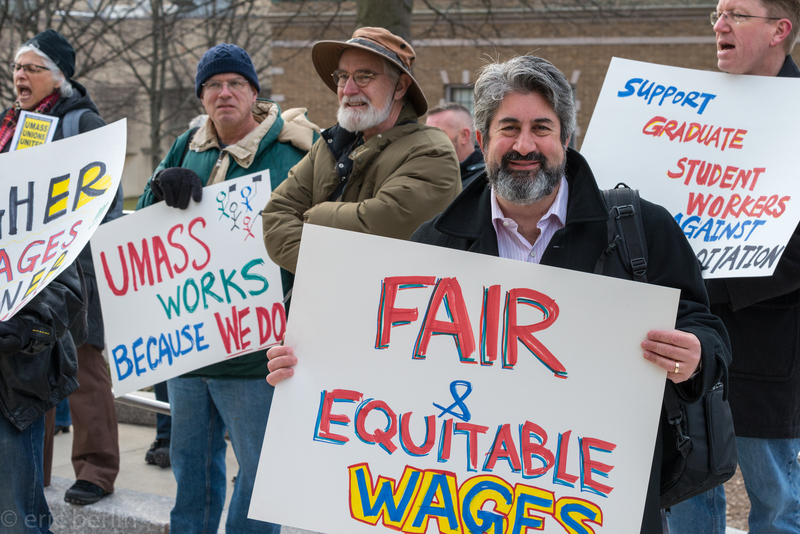 The Fair Share Amendment was proposed by Raise Up Massachusetts and is currently set to be on the November 2018 ballot (though the Massachusetts supreme court is currently deciding whether or not the Fair Share Amendment is constitutional). Weinbaum’s union and other unions spoke out in support of the Fair Share Amendment last summer. 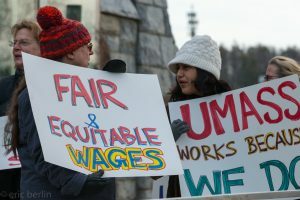 Weibaum said that union workers at UMass believe that the UMass Board of Trustees are protecting their own financial interests by not supporting the Fair Share Amendment, which could generate more funding for public higher education. The Advocate attempted to reach Chairman of the Board of Trustees Robert Manning and Vice Chairman R. Norman Peters for comment on this accusation but did not hear back by Tuesday afternoon. Jeff Cournoyer, vice president of communications for the UMass President’s office declined to comment on this issue. The Board of Trustees has not publicly supported the Fair Share Amendment.